Shrila Prabhupada’s most significant contributions, perhaps, are his books. He authored over 70 volumes on the Krishna tradition, which are highly respected by scholars for their authority, depth, fidelity to the tradition and clarity. Several of his works are used as textbooks in university courses. His writings have been translated into 76 languages. His most prominent works include: Bhagavad-gita As It Is, the multi-volume Srimad-Bhagavatam and the set of Sri Caitanya-caritamrita books. * In 1965, at seventy years of age, he ventured outside India for the first time to fulfill the order of his spiritual master. During his voyage at sea, he suffered two severe heart attacks. He reached the shores of America with the equivalent of seven dollars to his name. *He founded the International Society for Krishna Consciousness with a small group of disciples, after a year of struggling alone in New York City. This marked the only time in history that a Krishna devotee successfully trained non-Indians in the strict disciplines of Vaishnavism. Amazingly, this was achieved during the blossoming of America’s hedonistic counterculture movement. *He sent his followers, chanting the names of God, into the streets of cities and towns everywhere and Hare Krishna became famous in every corner of the earth. *He formally initiated approximately five thousand disciples. These initiates represented a sweeping diversity of nationalities, races, ethnicities, and religious backgrounds. *He established 108 Krsna temples on six continents, installed the deity of Krsna in each center and trained his disciples in the process of deity worship. Thirty-two new temples (almost three a month) were opened in a single year, between 1970 and 1971. *He inaugurated the Rathayatra Festival of Lord Jaganatha in major cities around the globe, in effect, bringing the temple to the people. *He instituted the brahmacarini ashram, something previously unheard of in Vedic culture, to give shelter to single women wishing to practice Krsna consciousness. *He instructed his disciples in 1967 to start an incense business to provide financial support for the temples. Within four years the business, Spiritual Sky Incense, generated an annual revenue of one million dollars (equivalent to $4,600,000 in 2004). *He introduced the “Sunday Love Feast” and other prasadam (sanctified food) distribution programs that provided millions of free meals to the public. *He created the world’s first chain of vegetarian restaurants. *He spoke daily on the philosophy of Krsna consciousness, delivering thousands of formal lectures. Over 2,200 were recorded and archived. *He conducted many hundreds of informal conversations on the science of Krsna consciousness with disciples, guests and friends. Over 1,300 were recorded and archived. *He had scores of interviews and philosophical discussions with news reporters, scientists, religious leaders and politicians, as well as meetings with world-renowned dignitaries and celebrities like Indira Gandhi, Allen Ginsberg, Ravi Shankar, Alice Coltrane, John Lennon and George Harrison. *He recorded more than twenty albums of devotional music. *He published the monthly magazine, Back to Godhead, which he called the backbone of his movement. At the height of its circulation in the mid seventies, over a million copies per issue were sold. *He launched the ISKCON Life Membership Program that enrolled tens of thousands of members. *He built major temples in Bombay and Vrndavana, and founded a spiritual city at Mayapur. All became international sites of pilgrimage. *He established primary schools to provide education in the principles of devotional service. *He founded the Bhaktivedanta Institute to advance Krsna consciousness within the scientific community, engaging serious academics in the consideration of the science of self-realization. *He formed the Bhaktivedanta Swami Charity Trust to unearth and renovate the holy places of Lord Caitanya’s pastimes. *He set up farm communities to teach “simple living and high thinking”, emphasizing cow protection and dependence on God and nature. *He commissioned his artist disciples to produce hundreds of illustrations of Krsna’s pastimes based on his meticulous instructions and the descriptions in his books. *He directed some of his followers to learn the Indian art of “doll making” to present Vedic philosophy through dioramas. This project became the FATE Museums. *He counseled his disciples on complex managerial, philosophical and personal issues in more than 6,000 archived letters. *He was the subject of more than 30,000 archival photos and more than seventy hours of documentary film footage. *He wrote approximately seventy books on the science of Krishna consciousness, sleeping only a few hours per day. Dozens of prominent scholars and educators from leading universities praised his work. The Encyclopaedia Britannica proclaimed that his voluminous translations from the original Sanskrit and his lucid commentaries “have astounded literary and academic communities worldwide.” This feat is even more astonishing considering the translations and commentaries were in English, which was a second language to the author. *He founded the Bhaktivedanta Book Trust (BBT) in 1972, to produce his books. By 1976, over 55,000,000 literatures had been published in twenty-five languages and distributed in almost every country, making the BBT the world’s largest publisher of Indian religious and philosophical texts. One printing alone of Bhagavad-gita As It Is required seventy-six train cars to ship the paper needed to print it. *He completed the entire Caitanya-caritamrta manuscript (seventeen volumes) in eighteen months. *He ordered and supervised the BBT in publishing seventeen volumes of his books in only two months time, in 1974. *Srila Prabhupada increased the standard of Deity worship in all the temples in Vrindavana, India when he installed the Deities in the Sri Sri Krishna-Balarama Mandir in the Vrindavana. Before this many of the Deities in the temples there were dressed in sheets, poor clothes, and even had bugs crawling on Them, and were often only offered tulasi water and no food offerings. Now everything has changed because of Srila Prabhupada, and numerous temples have beautiful worship for the Deities. 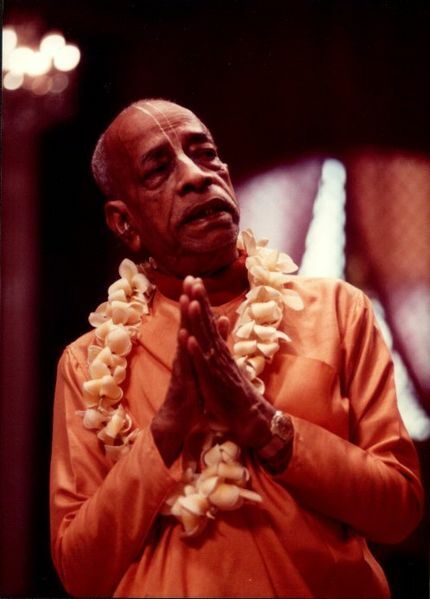 Even the shop owners who cater to the needs of the growing number of devotees, many of whom are Western, have become rich because of Srila Prabhupada. Many also have his portrait hanging in their shops. *Srila Prabhupada also circled the globe fourteen times, visiting twenty-four countries, preaching, inspiring his followers and making countless public appearances before multitudes of people. *He skillfully managed his international society simply through letters and personal meetings, virtually without the use of a telephone.